Wasim’s makeshift hair salon. Photo: Phil Le Gal / Hans Lucas. Men and boys queue in front of Wasim’s makeshift hair salon by the entrance of the Idomeni refugee camp in Greece. The young Syrian hairdresser managed to bring his tools with him on the long journey that brought him here from Aleppo, where his family owned a salon. When he realised that the closing of the border between Greece and FYROM was going to ground him here for an undetermined period of time he decided to put his tools to good use and to offer his services for a small fee. Many refugees from the camp in Idomeni are not staying idle. Some have opened small businesses which not only enable them to kill time and to make a little money but also to help their fellow refugees. However, they may soon run out of customers. An increasing number of asylum seekers are leaving the camp: either because they found a way to cross the border with the help of a smuggler; or to go to the official camps that are being opened by the local Greek authorities, where they are told their registration and asylum applications will be processed fastest; or, as increasingly is the case, to go back home. Given the rising temperatures and resulting hot weather in the northern part of Greece, Wasim’s clients mostly want their hair cut very short. However for his younger customers, Wasim skillfully crafts trendy hair styles. He charges €3 for a haircut or a shave. This is far less than what it would cost in the nearby town of Polikastro, which is 17 kilometres away and difficult for most refugees to reach. Wasim does not want to tell how much he makes, but judging from the line of waiting customers business is not bad. 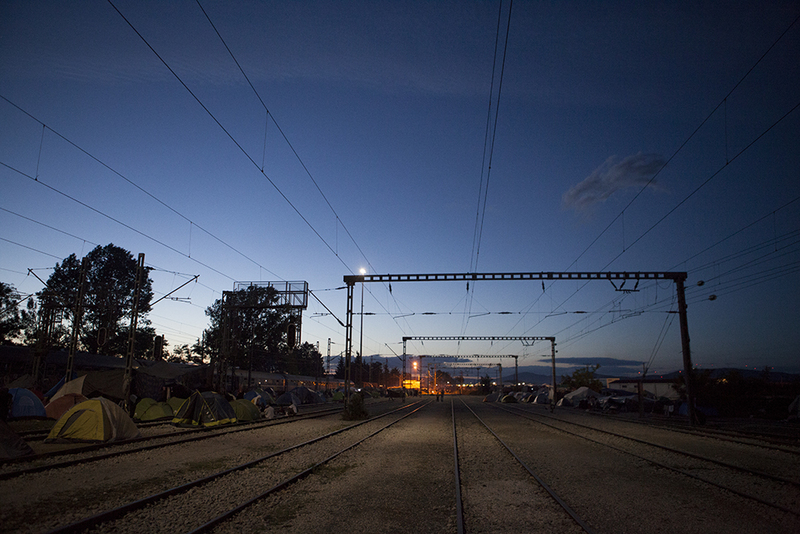 Idomeni’s refugee camp at night. Photo: Phil Le Gal/ Hans Lucas. Strategically located at one of the entrances of the camp, Wasim’s salon, like in any hair salon in the world, is full of gossips and rumours. This is where, after working hours, smugglers’ routes and fees are discussed and negotiated. Wasim is one of the candidates to leave the camp. He says he is looking for a backpack that will make the long march to Serbia through fields and along dirt roads easier. A few steps away from Wasim’s salon, Bachar fans a barbecue lined with kebabs. 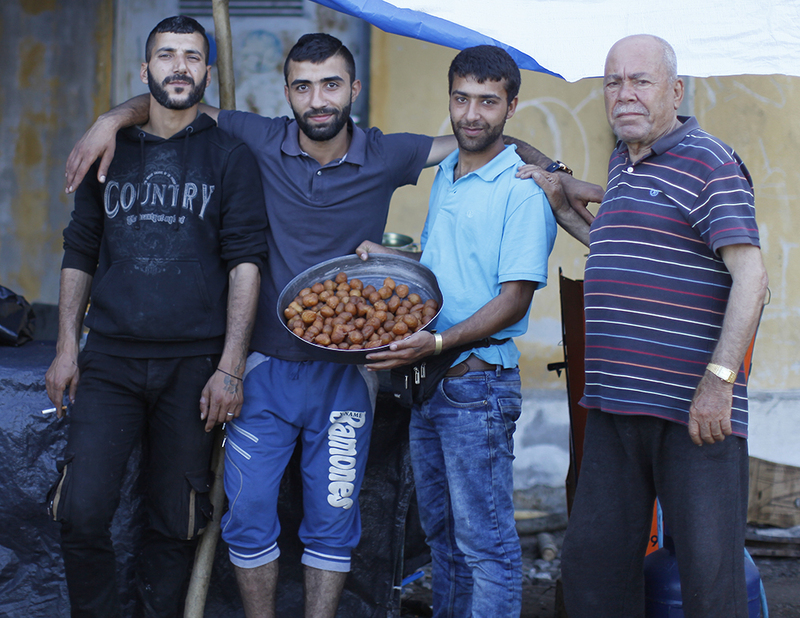 The professional chef has partnered with Akaram and Mohammed, two friends from his home town Deir ez-Zor, a large city on the shores of the Euphrates River, in Syria. Alone he would not be able to put up enough money to buy the meat and the other ingredients that he has delivered from Polikastro to the camp every day. The three partners take turn in preparing and selling lamb lebabs, a delicacy much appreciated by the residents who are bored with the camp food. Profits are small, about €10 a day, but it is enough to buy extra food for their children and the occasional pack of cigarettes. Cigarettes, smuggled from FYROM where they cost half as much as they do in Greece, are sold by numerous vendors across the camp: €2 for a pack of Rodeo, Macedonia’s favourite. Shawi’s Lokmat stall. Photo: Phil Le Gal / Hand Lucas. By the railway track, Shawi from Aleppo has turned an old rubbish bin into a gas stove. On it he fries awama or lokmat, a famous Middle Eastern sweet dumpling which is very popular, especially during the period of Ramadan. At €3 for six, they sell well. Shawi also partnered with two friends with whom he shares a profit of €30 to €35 a day. He says that if Germans like his dumplings he will open a shop in Germany, where he and his family wish to settle. For those who can afford it, kebabs, falafels, and awama bring some variety to the otherwise boring food that is offered by the NGOs in the camp. Artists, teachers, and musicians also make use of their expertise to bring a bit of entertainment and education to their fellow refugees. Ali Ahmad, a 27 year old from Syria, is probably the most active participant of the whole community. A professional nurse who is fluent in English, he volunteers as an interpreter for Médecins Du Monde, helps run the Solidari’Tea tent – which serves free tea several times a day –and is often seen running errands across the camp. Today, he is fixing some makeshift beds out of old wooden pallets. An unrelenting optimist he says, “I have made so many friends from all over the world here that whenever I go to Europe I will have lots of people to visit”. Such displays of creativity and resourcefulness despite dire living conditions and little knowledge of what the future might bring is proof that, if given a chance to settle in a safe and organised environment, these people would strive and be active contributors to the community and to the economy of their adoptive countries. European countries that close their borders to them are depriving themselves, not only of potentially talented but also resilient people who understand the value of a safe and peaceful environment and the benefits of hard work and of persistence. What a loss for ageing Europeans, who are continuously demonstrating for state support in every corner of their lives hoping that others will take care of their problems. What a lesson for our remaining youth on how to take one’s destiny and the destiny of their loved ones in their own hands without capitulating in front of adversity. This article has been published on OpenDemocracy.